Dermalogica sunscreen - Regardless if you burn in the first 20 minutes of direct sun exposure or you have olive skin that gets "sun kissed" in those same 20 minutes; the American Academy of Dermatology recommends using a broad spectrum water resistant sunscreen. Winter or summer, the SPF should at least be 30 or above.There are so many sunscreens on the market;so how do you know what type to use? Most of us worry about breaking out while using sunscreen. Well, Dermalogica has come out with a sunblock line for every type of skin. Each of their sunscreen provide protection against UVA and UVB rays. Their sun care line is available in sticks, sprays, lotions, and wipes. Making sunscreen application quick and easy. Dermalogica Sunscreen - Do you think your skin is too sensitive for sunscreen? This non chemical sunscreen protects your skin with mineral UV - blockers. Who should Use This - Those with sensitive skin or for those who have already been burned. Active Ingredients: Titanium Dioxide 6.7%, Zinc Oxide 9.2%. Inactive Ingredients: Water, Cyclopentasiloxane, Dimethicone, Butylene Glycol, Dicaprylyl Ether, Polyglyceryl-3 Polydimethylsiloxyethyl Dimethicone, Dimethicone/vinyl Dimethicone Crosspolymer, Aluminum Hydroxide, Stearic Acid, Camellia Sinensis Leaf Extract, Lavandula Hybrida Oil, Ascorbyl Tetraisopalmitate, Tocopheryl Acetate, Tocopherol, Dimethicone/PEG-10/15 Crosspolymer, Lauryl PEG-9 Polydimethylsiloxyethyl Dimethicone, Triethoxysilylethyl Polydimethylsiloxyethyl Hexyl Dimethicone, Caprylic/capric Triglyceride, Sodium DNA, Sodium Hyaluronate, Sodium PCA, Dipotassium Glycyrrhizate, Silica, Carbomer, Sodium Chloride, Sodium Citrate, Linalool, Tetrasodium EDTA, Phenoxyethanol, Methylparaben, Propylparaben. "The only sunscreen I will use on my son's face...fantastic!" Dermalogica sunscreen - I love that this product is able to eliminate one step to my skin care routine. 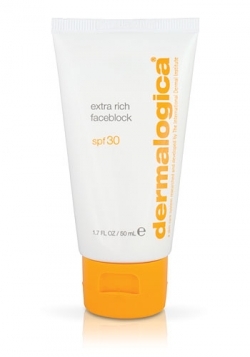 Dermalogica Extra Rich Faceblock SPF 30 suffices for both a moisturizer and sunscreen. The extra rich faceblock smooths fine lines, plumps, moisturizes, and protects the skin from sun damage. Who Is it For - Is a wonderful product for those with extra dry skin. How To use- Apply Extra Rich Faceblock 15 to 20 minutes prior to sun exposure. Active Ingredients: Homosalate 6.5%, Octinoxate 7.5%, Octisalate 5.0%, Oxybenzone 4.0%, Zinc Oxide 2.3%. Inactive Ingredients: Water, Simmondsia Chinensis (jojoba) Seed Oil, Dipropylene Glycol, Cetyl PEG/PPG-10/1 Dimethicone, Butyrospermum Parkii (shea Butter), Caprylic/capric/myristic/stearic Triglyceride, Oryza Sativa (rice) Bran Wax, Cyclopentasiloxane, Glycerin, Pyrus Malus (apple) Fruit Extract, Algae Extract, Yeast Extract (faex), Oils Of: Borago Officinalis Seed, Oenothera Biennis (evening Primrose), Geranium Maculatum, Cupressus Sempervirens, Eucalyptus Globulus Leaf, Santalum Album (sandalwood); Hydrogenated Castor Oil, Palmitoyl Oligopeptide, Glucosamine HCI, Palmitoyl Tetrapeptide-3, Ascorbyl Tetraisopalmitate, Tocopheryl Acetate, Tocopherol, Hexyldecanol, Sodium DNA, Sodium Hyaluronate, Polyglyceryl-3 Polydimethylsiloxyethyl Dimethicone, Triethoxysilylethyl Polydimethylsiloxyethyl Hexyl Dimethicone, Octyldodecyl Neopentanoate, Urea, Coumarin, Carbomer, Polysorbate 20, Cetyl Dimethicone, Caprylic/capric Triglyceride, Isostearic Acid, Butylene Glycol, Dodium Chloride, Phenoxyethanol, Methylparaben, Propylparaben. "Has helped with my extra dry skin."